SpezDispenser wrote: I like gorges. Would love him here. He has a NTC and gives Mtl 15 teams he will accept a trade to. As per Bob MacKenzie, all those 15 teams are in the US. SpezDispenser wrote: Meh. He's still young and can play an excellent 2nd pairing role IMO. Remember when we traded VOlchie? He was 2 years younger than Gorges is today. You can only block so much shots in one career IMO. He's so upset, wow. Says he's in shock. Montreal wants Boyle apparently, so I guess they're shipping out gorges to sign Boyle. Did Phaneuf criticize Gunnarson when Gunner got traded? Anyone have anything on that? UFA goalie Ryan Miller is in VAN being wooed by Canucks' brass. might be the best idea for Van but i guess this puts an end to the idea that Miller will only go to a contender. My guess is that they sign Miller, then go back and forth on whether Lack or Miller is the true #1. Then Miller'll ask for a trade, only to see that they trade Lack instead. Then they'll trade Miller for a bag of pucks and go with Markstrom as the number one. Rinse and repeat. SpezDispenser wrote: Wow, they didn't have to retain? Damn. Tampa retained. They ate a third. Clearly, they didn't have any interest in his services. Pure cap dump. SpezDispenser wrote: He's so upset, wow. Says he's in shock. I think Detroit wants Boyle as well. whatever happens it seems we'll have boyle playing against us in the division... not cool. why are we not in on this? Flo The Action wrote: whatever happens it seems we'll have boyle playing against us in the division... not cool. why are we not in on this? Boyle will get too much term and money for an ancient, slowing dman. What if Detroit signs both Boyle & Iginla. Where does Alfie fit? Nowhere. They won't sign him I don't think. Toronto is in rough shape. About $17M left to sign a pile of players. They currently have 8F/4D/1G on the books. Unless they bring up some rookies, they have some work ahead of them. spader wrote: Toronto is in rough shape. Rumours are they are trying to move Lupul. You don't think that's the player Murray's getting? Are you asking if I think Lupul is the player Murray suggested as a target? If so, no. 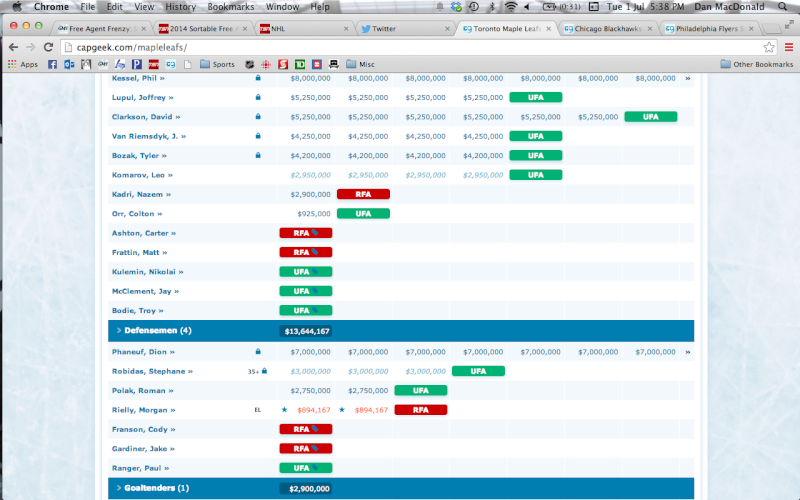 Murray suggested a C in the $3M range, at least that's what I read on here. Lupul is a $5.25M LW and plays on the Sens most hated rival. I find it very unlikely. tim1_2 wrote: Boyle will get too much term and money for an ancient, slowing dman. Rangers sign D Dan Boyle to two-year, $9-million deal. Claude Giroux spent the night in an Ottawa jail for repeatedly grabbing a cop's Donkey. I hope it wasn't a dude.